There was Stevenson, then Ransome... and now Julia Jones. Arthur Ransome used to say that behind every storyteller stood another, and another, back into history. It was, in effect, how the lore of the tribe was both preserved and evolved. 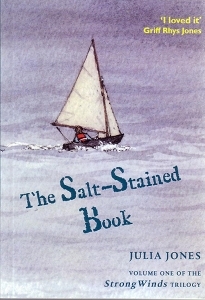 Julia Jones, who grew up on Ransome's yacht Peter Duck, and still owns and sails the boat, is quite explicit about Ransome's role as her literary antecedent. At one stage key characters in these books were to be direct descendants of the Swallows, but the Ransome Literary Estate put its foot down about that and the connections and references are looser and more generalised (and sometimes artfully hidden). But the modern world Jones's children inhabit is very different from the charmed sanctuary of Wild Cat Island. Loss of identity, separation from family, institutional bullying, corruption and, in the second volume, the very worst kind of smuggling are what 13-year-old Donny and his fellow care-home inmate Anna are up against. It's not by any means unrelieved gloom, however. These yarns mix fast-paced adventure and deeply moving, heart-wrenching situations, all told with style and some of the understated humour that is also one of the delights of Ransome's own writing. There is also the consolation, for Donny, of discovering his love of sailing, and an innate aptitude for it. Light relief is provided by the two larky dinghy-mad sisters Xanthe and Maggi. Sailing is in fact integral to these stories, and the locale is equally important. It's centred on the River Orwell around Pin Mill, downstream to Shotley, up to Ipswich and up the coast as far as Lowestoft. These are waters the author knows well, and they are deftly worked into the narrative. The first volume, The Salt-Stained Book (named after an heirloom that might once have acquired its patina aboard the Goblin in mid-North Sea) is mainly Donny's story. 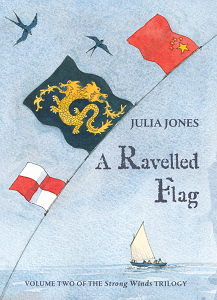 In the second, the newly-published A Ravelled Flag, the focus turns more towards Anna's search; the themes are darker, but the page-turning narrative pace is just as strong. Just like Ransome's tales, the paramount qualities celebrated in these books are loyalty and mutual suppor – the difference here perhaps is that these virtues are applied in real situations, against real, and realistic threats. The third volume, Ghosting Home, is due next summer. Published by Golden Duck www.golden-duck.co.uk. Both books are available through the Nancy Blackett Shop. This article is ©2011 by Peter Willis, and posted on All Things Ransome with permission of Mr. Willis and the Nancy Blackett Trust. It originally appeared in the Winter 2011/12 edition of Jibbooms and Bobstays, the Newsletter of the Nancy Blackett Trust.